And a signed copy of Tea and Sweets! Win this basket by entering below! Each comment you leave also counts as an entry. Only a few hours left! Well, whoever the winner may be, thank you, Phyllis, for providing an opportunity to keep elegance in the home through such a lovely collection of items. Good luck to all! My sister turned me on to the joy of afternoon tea. Would love to win this for her, as it will melt her heart. What a beautiful gift basket. I would enjoy taking tea with my three daughters using the goodies in this basket. “Beautiful Basket” would love to win it. Lovely treat to win this basket. It would be a welcome addition to our new home. What an amazing basket. Hope I win! We love Tea Time and have received every copy since Lorna has been editor. Her dad and I are great fans of tea and would totally enjoy the wonderful items in the beautiful gift basket! I have bought Tea Time before and have loved the recipes and the format of the magazine. I love setting tea for my wife and myself. As the weather gets cooler here in Northern California I start thinking about tea and how it just soothes you and lets you sit and steep a while just like a good pot of Tea. It is starting to get cooler and feeling like fall is coming here in NJ. Time to re-arrange the decorations in the home, and think of the holidays ahead while enjoying the warm comfort of tea. I can’t think of a better gift to make that moment complete! I’d be thrilled to win this lovely tea basket! Would love to win this tea-rific surprise! Lovely giveaway, Phyllis! Hope my name is chosen. I’m thankful for all the beauty and inspiration you provide through your publications. What a beautiful prize. Good luck to all those who enter. I know that anyone would love to have it as much as I would. I receive Tea Time Magazine and absolutely love the recipes!!! I have tea with my friends once a month and love sharing the things I learn from each magazine article. Thank you for adding to the memories I have with each tea. 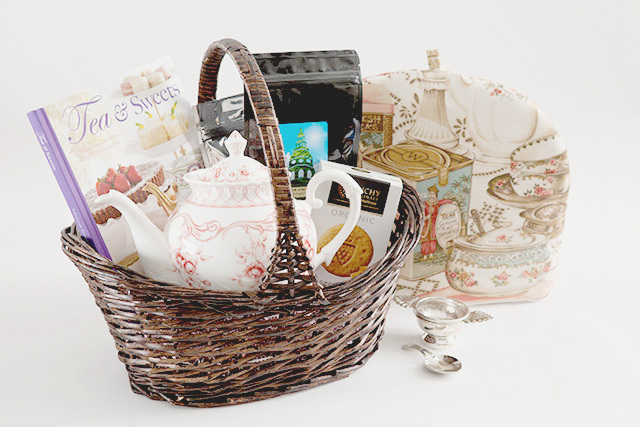 I have loved drinking hot tea for years and would love to win this lovely tea basket. Always enjoy reading your blog and the comments too. Phyllis love you “Journal” posts and all of the Hoffman magazines – especially when you share your love of Tea! Always share with our Tea Friends at Tea & Thyme and re-create your wonderful recipes at our Tea Celebration Events! Thank you! What a wonderful treat! Would love to win. Thank you. I don’t have a blog just love anything by Phyllis Hoffman DePiano–have Victoria and Southern Lady and your beautiful Evening in May CD. I collect tea pots–my two specials are the first one given to me by a Sunday School teacher when I was in the 7th grade and a blue & white one my daughter brought back from a mission trip to Russia several years ago. Thanks again for starting the Ribbon in My Journal–love it. Oh, I have lived in eastern North Carolina all of my life. Your gift offer is beautiful and will be a treasure to the recipient! This Tea Lover’s Giveaway is exquisite and perfect for every day. Im designer for Custom Mug Cozy ,I will fall in love with this award because im tea lover ,thanks for thisopportunity! Lovely….hope I am the lucky one! Beautiful!!!! I sure would love to win this…. I never win things….. but still put my name in….. Everything looks so gorgeous…..I give tea parties in my home…. I do not advertise, only use word of mouth…. but my hubby Sir William, and I are having a ball. thank you. I’d love to win this basket! Wonderful offer. What as great way to start the fall season! Love! I noticed a lot of people commenting about not using Facebook or Twitter, but I remember also seeing an option to enter using email when I noticed this contest on my iPhone. Beautiful basket! Would love to win! What a wonderful selection in a basket!!! I would so love to win this! What a lovely basket of gifts! Thank you for this opportunity! Thank you, Phyllis, for the opportunity to win such a beautiful giveaway! Lovely! Always enjoy all of your books AND magazines. We read them faithfully! Following on all! I am keeping my fingers crossed! Sadly, as several have already stated, this is a rather biased contest. I purchase many books from Hoffman media, stalk the newsstands for (and purchase) the latest Southern Lady, Victoria and Tea TIme magazines and look forward to The Ribbon In My Journal emails. I choose not to participate in FB and Twitter but do follow Pinterest and The Ribbon in My Journal boards. As you see, I am a die hard fan and totally support and appreciate you. All of this I mention in heartfelt sincerity. Thank you for listening and hopefully changing your contest rules to include all of us. Your tea basket is absolutely lovely! Your comments count as entries! Sorry for the confusion. What a lovely basket! I too love Victoria and Tea Time magazines. I’m putting my email address in so I can enter the contest too. You didn’t have this option above, only Twitter and FB. Wow. I don’t think you could have put together a lovelier basket for a tea enthusiast like myself. So sad that your contest discriminates against those of us that are not on Facebook or Twitter. I’ve been a long time fan and subscriber of Victoria and Tea Time magazines. Very disappointed in your bias contest ! I’m not sure if you noticed, but you can also enter using email. Sharon, each comment you leave also counts as an entry. Sorry that wasn’t clear! We avid readers of “Tea Time” and other publications of the same as well as Phyllis’ blog don’t count? I too, was not allowed to enter. I am sad indeed. I love the blog and all things “tea”. Have hosted many a tea party. This basket looks so inviting! I love everything tea and Victorian. Love the Tea and Scones book! I made the white chocolate peppermint scones and everyone raved at the Christmas tea I attended.So many other wonderful scones to make. I have a teapot and teacup collection. I use my garden window for teapots rather than plants and change them with the seasons. I would love to win this lovely basket! So glad that you publish Victoria as well as Tea Time. My very favorite magazines. Like several other readers, I also cannot seem to figure out how to enter the giveaway. Although I enjoy the blog for the same reason I enjoy Victoria, I think it would be fun to be able to enter. Thanks for sharing your memories and experiences with us. I feel as if I have met a new friend. I also would like to enter to win this beautiful basket of wonderful things but if you do not do Facebook or Twitter you cannot even enter. This is an unfair restriction to people that are more private and do not do these social media. Your comment is considered an entry, Andrea! Iam a tea lover for about 25 years. I would like to win this beautiful gifts..
A lovely collection for tea lovers. I really enjoy Tea Time magazine and have used many of the recipes in my tea parlor for afternoon tea parties. I look forward to each new issue. Victoria is another one of my favorite magazines. The cool air tonight reminds me that hot tea weather is almost here! I love to have teas for friends and winning this basket would make the experience so special. I too wish to win this generous basket of goodies. Like all the ladies above I do not have Twitter or face book is there any chance to somehow be included? OMG, so beautiful. I would love to win this. The basket is beautiful and would love to have a chance, but I do not use Facebook or Twitter. I do, however, subscribe to many of your publications such as Victoria, Teatime, The Cottage Journal, Celebrate, Southern Lady, and Taste of the South. I am Donna Pastor, bpastor68@gmail.com–give me a chance to win and others who do not twitter or Facebook. Like many other loyal readers I do not do Facebook or Twitter, and I do not think that should be the deciding criteria to eliminate anyone. I am an avid fan of Teatime and your wonderful blog. Thank you ever so kindly for letting me express my opinion. Must I involve myself in Facebook or Twitter to be able to be included in the lot to win your lovely tea basket? I’m not fond of either but so enjoy your blog and lovely magazines. Very disappointed. An added treat and would bring back warm memories. Hi Pamela, your comment is considered an entry. Thanks! Oooh . . . what a beautiful giveaway! Would love to win and share with friends. I LOVE Victoria Magazine and have every issue printed. I was thrilled when the magazine returned. My daughter is getting married next March and I’ve ordered “Tea & Sweets”…many of the recipes will be served at her reception. I will be hosting an announcement tea before Christmas for her and can’t wait to try the recipes. Victoria is my favorite magazine! What a lovely tea basket! I’ve been a tea lover for as long as I can remember and it would be heaven to win this! Thank you! What a gorgeous basket. Love my tea and enjoy my bone china cups and mugs. Looking forward to hearing from you. What a beautiful tea basket! This is the right tea pot! I have looked for years and have not found one I really like. Of course I love tea. It is just says cozy. I am a tea lover and this would be a great gift at our house! Would love to enter the contest, but do not participate on facebook or twitter so……….how? This comment is considered an entry — not to worry! Pretty tea items! Thank you for entering me! Tea time coming up on October 11 with special tea friends! I would love to win this beautiful basket of tea-related fun! My grandmother started a drinking tea in fancy cups tradition with me when I was a child. I have continued this wonderful tradition with my granddaughter. And, I just learned I will have another granddaughter in January to share our family love of all things “tea” . I sponsor a Valentine Tea in our church; our little community in rural Texas had to be introduced to the love of tea and tea time. Now we all exchange new teas and tea ideas. Everything in the basket is so lovely! Teatime is a very special time in my life, so that would make it even more special! Such a lovely basket. I adore that little sugar bowl. I have a border in my bedroom much like that sugar bowl pattern — so neat. I am blessed with 4 granddaughter and one of them is definitely a tea lover.. I give each one a tea cup and saucer on their birthday in hopes they will enjoy having their special friends for tea. Beautiful gift. Thanks for the opportunity! What fun! I am looking forward to adding the book to my collection in any case. Thank you for imagining it as part of a gift basket we might win! I’m enjoying a fresh Honey Crisp apple with a cup of White Earl Grey tea at this very moment! Tea is such a celebration! I absolutely love this basket – how great it would be to win it! Thank you for offering it. I love tea and all thongs related, especially TeaTime magazine. This is a lovely gift…I love anything to do with tea…I already have so meant tea pots but there always seems to be room for one more…my latest is one with lady bugs on it! I usually switch out my teapots according to the occasion and the seasons…which reminds me, I have to get out my pumpkin orange teapot! Thank you again for the special giveaway. I want to buy this! I never win at contests, but I need this. Send details! As I sit here enjoying the first of many cups of tea today, the email was perfect and the contest even better! I love everything about what you are doing….”The Ribbon in my Journal” seems to always touch me is such a sweet way….have loved Tea Time magazine for a long, long time….and just love the beauty that even the very thought of a time for tea stirs in my heart. Would so love this to brighten my world right now. Oh, how wonderful! What a great time of year for this basket. Thank you for the chance. What a generous gift Phyllis. After 50 years of grinding my ow beans I have converted to drinking tea. I would love this charming basket. I have all your other ‘tea’ books. look forward to having this one, too. What a warm and lovely gift!! Thank you for offering it. Would so love to win this gorgeous gift! Have been eyeing the Tea and Sweets book most ardently!! Thank you for the opportunity to enter! I share the lovely stories and pictures with my daughter Julie..She and I love the beauty that you bring into our lives when you share with us..thank you and God Bless. Love tea. I enjoy reading your blog. It is like I am visiting a friend. I hope, I hope, I win the gift basket! I am awaiting my copy of Tea and Sweets! I collect teapots, tea cozies and ALL THINGS tea. I absolutely love TeaTime magazine. That and Victoria are my fave magazines. I always make sure my subscriptions are up to date. That is a wonderful gift. I collect tea pots and this one is beautiful and would make a great addition to my collection. I have also made several tea cozies. Beautiful – like everything you do. Tried to enter, but when I hit the button the hourglass just spun around continuously. Have a nice day! I’ll count this as an entry! Thanks, Susan. Thank you for offering such lovely prizes. What a beautiful basket of goodies and that tea cozy is so charming!! Have a delightful day!! Sharing tea with someone, especially Hoffman Media and good friends, really is a beautiful thing, isn’t it! As a 50 year tea lover this would be so nice. Would be so neat to win this. Would make beautiful gift for my daughter who just loves her tea.